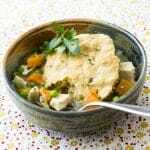 Today I have the best Chicken and Biscuit Casserole made from scratch to share with you here on the food bloggy blog. 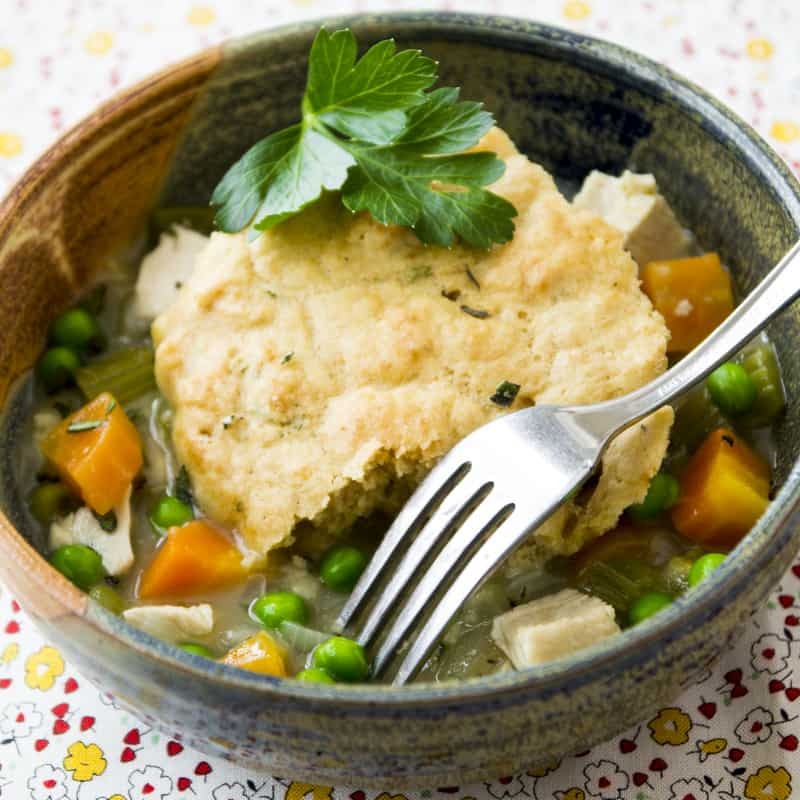 It’s made with carrots, peas and fresh herbs and has an easy whole-grain buttermilk drop biscuit topping. Yummy for the whole family! Have you noticed that now you can browse Healthy Seasonal Recipes by categories? Like Kid Friendly, Gluten Free or Paleo? Well, if not, check out a list of the most popular categories here. One of the new categories I created when I was working on the redesign is called The Best of Healthy Seasonal Recipes. These are my very favorite, proudest moments, go-to-again-and-again recipes from the last three and a half years of blogging. They seem to strike a chord with you all too, I’ve noticed, from the emails, comments and feedback I get about them. When I redesigned the site, one of the recipes I wanted to add to that best-of list was my Chicken and Biscuit Casserole. But I didn’t. Even though the recipe has been an absolute favorite since I first blogged about it in 2010. The real reason I didn’t put it in the best of category was because I didn’t like the picture I had taken of it back then. Take a look for a good laugh. I remember that evening. It was mid-November and I had run out of light in the day. In desperation I had ended up using my compact flash. Oh the horror! I tried to fix the white balance in Lightroom. But really there is no reason anyone should use a compact flash for food photography. And let’s face it, that shot had a lot more problems than white-balance. Ugh. For more about food photography do’s and don’ts read this and this. Anyway, when I went through and selected the recipes for the “best of” I knew I needed to re-shoot the Chicken and Biscuit Casserole recipe. Originally, I created this casserole recipe with leftover turkey, but since then I have made this recipe a lot, and I usually use chicken. So I have updated the recipe to include the step of cooking the chicken. Feel free to use leftover chicken or turkey though. Either way, you’ll need three cups of cooked chicken or turkey for the recipe. It still has the super easy drop biscuit top made with whole-grain flour. And now, finally the Chicken and Biscuits Casserole is where it has always belonged, in the “Best of” category. 1. Poach the chicken — To poach the chicken, you simply have to place it in a pot and cover completely with cold water. Turn the chicken occasionally in the poaching liquid and remove it from the water once it’s no longer pink inside. Cut the chicken into cubes and set aside. 2. Prep the filling — Heat some oil in a large saucepan and add in the diced onion, carrots, celery, garlic, salt and pepper and cook until the vegetables are softened and starting to brown. Then sprinkle some all-purpose flour over the vegetable mixture and stir to coat. Add the chicken broth and bring the mixture to a boil, stirring often. Finally, stir in the chicken, peas and herbs before transfering the chicken mixture to the prepared baking dish. 3. Make the drop biscuit topping — The homemade drop biscuits are a combination of all-purpose and white-whole wheat flour, baking powder and baking soda, egg, buttermilk, oil and herbs. Mix according to the instructions below and the drop by the spoonful over the chicken and veggie mixture. 4. Bake the chicken and biscuit casserole —This easy chicken casserole needs to bake until the biscuits are puffed and golden. 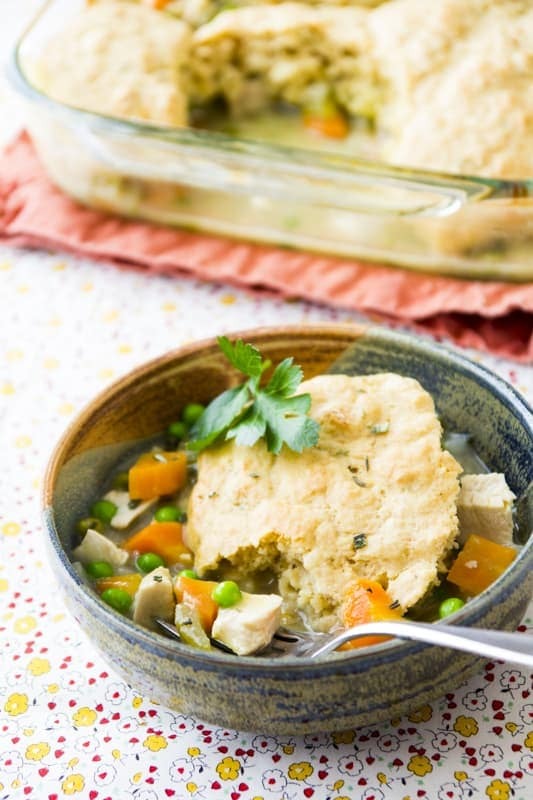 Chicken and Biscuit Casserole made from scratch with carrots, peas and fresh herbs and an easy whole-grain buttermilk drop biscuit topping. Yum! 2 large chicken breasts, about 1 pound 4 oz. Place chicken breast in a medium saucepan and cover completely with cold tap water. Place over high heat and bring to a simmer. Reduce heat to maintain a gentle simmer and cook, turning in the poaching liquid occasionally until the chicken is no longer pink in the center and cooked through, 15 to 18 minutes, depending on thickness of the meat. Remove the chicken and let cool. Cut chicken into cubes. Preheat oven to 400 degrees F. Coat a 9 by 13-inch baking dish with cooking spray. Heat 2 tablespoons oil in a large saucepan over medium heat. Add onion, carrots, celery, garlic, 3/4 teaspoon salt and pepper and cook, stirring occasionally until the vegetables are softened and starting to brown, 10 to 12 minutes. Sprinkle 1/4 cup all-purpose flour over the vegetable mixture and stir to coat. Add broth and bring to a boil, stirring often. Stir in the chicken, peas and 1 tablespoon plus 1 teaspoon herbs and return to a simmer, stirring often. Transfer the chicken mixture to the prepared baking dish. Whisk the remaining 1 cup all-purpose flour, white-whole wheat flour, baking powder, baking soda and the remaining 1/4 teaspoon salt in a medium bowl. Whisk egg, buttermilk, the remaining 1 tablespoon canola oil and the remaining 2 teaspoons herb mixture in a large bowl. Add the flour mixture into the buttermilk mixture and stir until a shaggy dough forms. Drop by spoonfuls over the chicken mixture. Transfer to the oven and bake until the biscuits are puffed and golden and the sauce is bubbling, about 25 minutes. You can totally use rotisserie chicken with this recipe. Maybe drop the added salt a hair, but you have a great idea there, especially for a busy weeknight. Yes I love buttermilk too, but I don’t always keep it on hand. So to make a substitute, it is fine to mock some up with a little lemon juice and milk. What a comforting meal this is! Especially on Monday night, Mondays can be so hectic! I love that this dish is so full of vegetables and green colors! Ugh, Monday evenings are tough I agree. Using left-over chicken is a great shortcut on busy nights. Or like Alexis said in the comment above, rotisserie chicken is a great easy way of eliminating the first step. Thanks for stopping by Julia. Love this recipe! Healthy comfort food. So yummy! Thanks Carla. I don’t think I will ever get sick of making over those old fashioned comfort-foods. This is a keeper for sure. Wow, that sounds very interesting. I love the biscuit idea, as I have never tried something like that before (I have almost no baking experience). I was wondering whether I could buy the chicken already cooked in cubes and boil it to save time, or would it taste too watery or have an unpleasant texture? Correction: I meant “already cut into cubes”. You can do that Hana. Keep an eye on it, as it will cook faster. Overcooking would give it an unpleasant texture. Enjoy! Love the recipe. I just tried it out, only the biscuit turned out a little bit doughy. I am not experienced with baking, so I thought I’d ask what I can do to make the biscuit more crunchy. Any idea what I might have done wrong? Hi Hana, When you say doughy, do you mean on top- as in undercooked? Or on the bottom, where the biscuit touches the chicken stew?